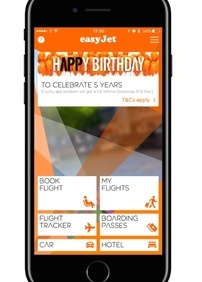 easyJet, Europe’s leading airline, and its mobile partner MTT is today celebrating the fifth anniversary of its industry-leading mobile app. Since launching in 2011, easyJet’s mobile app has been downloaded more than 19 million times with more than 20% of bookings now made via the app. The number of passengers using mobile boarding passes also increased more than 60% year-on-year thanks to the app’s intuitive design which makes it so easy to use. In the last five years the app has won a number of industry accolades, has been ranked in the Top 5 Travel Apps Chart in 94 countries and has had 48 No.1 positions in the App Store. With more than 60% of its total star ratings achieving 5 stars, it is the most loved airline app in Europe. Amongst other innovations, it was the first airline app in the world to have a real-time Flightradar24 tracking feature and the first European airline app to have a passport scanning function. To mark the milestone, easyJet has launched a competition in the UK where five lucky customers that book flights via the app will win the full value of their booking back. The competition starts today (Friday 9 December) and will run until Monday 12 December. “Over the last five years our app has become central to how millions of customers interact with us across Europe and we’re delighted to have pioneered a number of innovative industry firsts that really add value. Since its original launch, the app has evolved from streamlined booking and check-in functionality to include popular, innovative features including Mobile Host which provides real-time notifications to give passengers helpful information and tips, Apple Pay, flight tracker and a dynamic home screen that is contextual and location-aware.